It's hard to believe that fruit.root.leaf. has been in action for almost two years. While we've thoroughly enjoyed the experience, we'd particularly like to know what you, our dear readers think. What did you like? What did you love? What could you do without? What should we do lots more of in 2013? We're asking that you take a couple of seconds to share your feedback in the poll below. NOTE (03.2013): The polls are closed. If you would still like to provide feedback, please feel free to let us know what you think in the comments section. 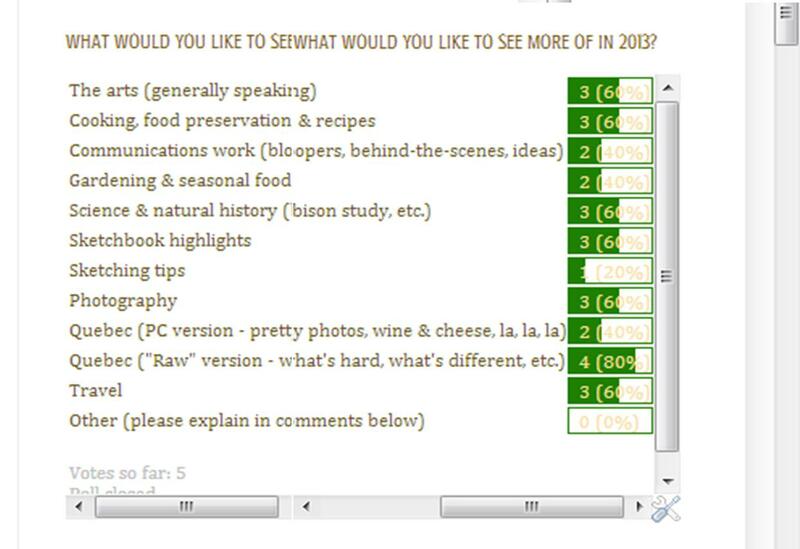 Question: Which topics did you most enjoy in 2011-2012? Question: What do you think of the format? Question: What would you like to see more of in 2013? Hi there! I tried voting on your questionnaire, but for some reason it said it couldn't send. Anyway, I just wanted to let you know that I thoroughly enjoy reading your blogs. For me, the history and the interesting things you do in and around Quebec are the highlights. Also the way you describe and photograph your travels lets me imagine I was a fly along for the ride. ;) The food gathering and harvesting is also very interesting, even tho I don't expend that sort of effort anymore! Uncle Lou enjoys Jerod's escapades with the wildlife. Thanks for taking the time to keep us all informed of what you 2 are up to! It's great to hear you are both reading the blog, still. :) And, it's great that we can even catch Uncle Lou's interest sometimes. 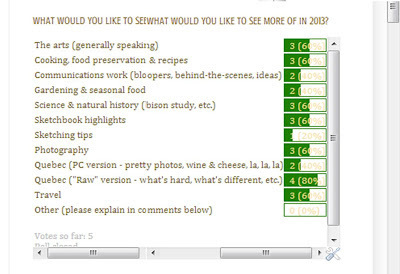 We will definitely keep your votes for history, photography, food and wildlife in mind as we "type" into 2013. Bethann, I am overjoyed to know you are learning such diverse and interesting things! You both seem to have taken Quebec to heart and are experiencing the opportunities available. Inspirational! Thank you for your gorgeous photography and artwork, recipe, and journal entries. Love you! Hi Rachel,Thank you for your wonderful comment on the blog! It means SO MUCH to hear from you that you enjoy the posts! Sometimes, it's hard to tell if it's all just going out into the void. It's always a pleasant surprise to hear from people who are reading it and enjoying it.